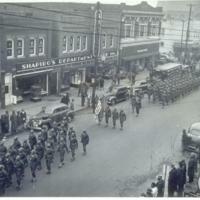 This photograph depicts sections of the 3166th Quartermaster Service Company, Color Guard, and 3167th Quartermaster Service Company of Camp Hill as they marched down Jefferson Avenue in Newport News. 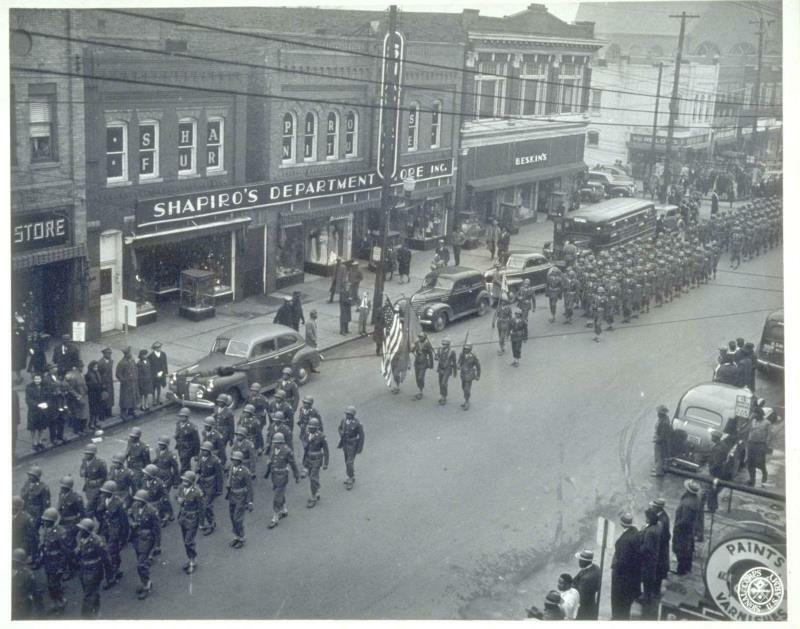 They, along with Shipyard workers' floats, Camp Hill Quartermaster Service Companies, and the Camp Hill Band, did so during a parade which marked the 81st Anniversary of the Emancipation Proclamation. The Emancipation Proclamation, issued by President Abraham Lincoln on January 1, 1863, declared freedom to enslaved people within states that were in rebellion against the United States. All slaves in Virginia were to be free, but this could only be enforced in areas controlled by the Union army and as such, a small number of Virginian counties and parts of western Virginia were excluded from this -- when Lincoln issued the proclamation, it was clear that the western part of Virginia would become a seperate state with a new name. There were a number of localities in Virginia where slavery continued under the laws of Virginia. These included the upper Potomac River Valley county of Berkeley, two Eastern Shore counties of Accomack and Northhampton, and the Hampton Roads counties of Elizabeth City, Norfolk, Princess Anne, and York, as well as in the cities of Norfolk and Portsmouth. In many of these areas, the established presence of the Union army had already allowed people who ran away from slavery to live in virtual freedom. In the remainder of Virginia, when present, the Union Army did their best to enforce the terms of the Emancipation Proclamation -- however, this did not free all enslaved Virginians. In most of Virginia, a majority of men, women, and children who had lived in slavery when the Civil War began, continued to live in slavery until the war ended in April 1865. However, the Emancipation Proclamation did directly influence slavery in Virginia and created unusual legal problems -- two states of Virginia, each with its own governments within the Commonwealth. One remained loyal to the United States and was created in the summer of 1861, which restored part of Virginia to the Union. The capital lay in Wheeling until June 1863 when it was moved to Alexandria. The other part of Virginia was that of the Confederate States of America, with its capital in Richmond. Citation: U.S. Army Signal Corps. Parade Celebrating the 81st Anniversary of the Emancipation Proclamation, Hampton Roads Port of Embarkation, 1944, Print & Photographs, Special Collections, Library of Virginia, Richmond, Virginia. Analyze: Why do you think Virginia was so divided by the Emancipation Proclamation? In Their Shoes: What kinds of changes do you think slaves may have expected after the Emancipation Proclamation was put into law? What do you think they did after it became law? Virginia Validation: How do you think the Emancipation Proclamation affected other states? Do you think Virginia's experiences were similar to them? Up for Debate: Do you think parades such as these are important? Why or why not? Social Media Spin: Imagine you are attending and watching this parade - create 140 character summary, including hashtags, to explain the experience and/or importance of the event. 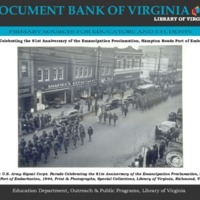 “Parade Celebrating the Anniversary of the Emancipation Proclamation in Hampton Roads, 1944,” Document Bank of Virginia, accessed April 21, 2019, http://edu.lva.virginia.gov/dbva/items/show/190.